Tree trimming is the selective removal of parts of a tree such as branches or leaves, the reason behind tree trimming stems from its beneficial advantages such as shaping or controlling of direction of growth, removal of deadwood or general health maintenance. Trimming benefits the tree by improving its health and enhances growth or restricts growth for one reason or the other. When too much growth causes a disturbance you can cut off parts of the tree this can be one method of controlling direction of the tree. Stimulating growth can give the tree its perfect beautiful shape. Tree trimming is an important aspect that should be done whenever necessary for tree strength enhancing technique. Tree trimming is subject to a number of conditions and necessities. The conditions include timing while correct efficient equipment is very necessary. According to professionals the best period for tree trimming is in the late winter calm early spring. An important aspect about tree trimming is getting it right. As in timing it’s during the period of late winter to early spring that budding takes place you should therefore take advantage of this as trimming at this time will increase the trees chance to develop in healthy natural way. Cutting off wrong parts is the biggest mistake in tree trimming hence careful consideration should be taken so as to cut off in right places. The effects of cutting branches in the wrong place reduce the strength of the tree by wounding it. Once there is an open wound the tree is susceptible to fungi infection, which we try so hard to avoid. Proper cuts create better survival rates for a tree when removing branches. The tools used in trimming include pruning tools such as loppers, pruning saw and hand pruner. Other more conventional tools known for tree trimming include the chain saw that come in several models. The how and why should guide your tree trimming endeavor for our aim is not to harm the tree but to enhance its health. We have different types of trees that come in a myriad of shapes and sizes. While some are dense others have little branches. The dense trees provide good shade but can at times outgrow in a messy way. Tree trimming is the solution when it comes to shaping. There are various techniques to trimming a tree that include removal of deadwood labeled as cleaning, thinning, raising and reduction. How then can you trim a tree in easy to follow steps with a chain saw? Making the cut is made easy as it works in three easy to follow steps that moderate the process. A sharp saw can be efficient equipment for cutting off branches, which begins by making an undercut one or two feet from the trunk. This should make a cut of about one third of the branch’s girth. Continue with a second cut from the top about three inches from the first cut. If the correct procedure is followed then the branch will fall off. 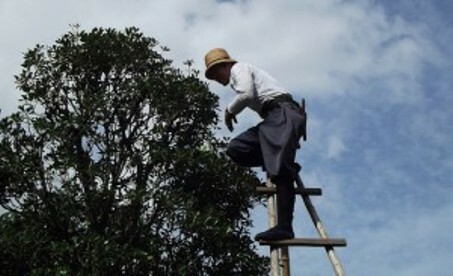 The process of tree trimming is easy enough and can be done by most people, however professional help is recommended as a safety and risk management. Even its almost always best to let professional arborist do the task of tree trimming for you here is a simple breakdown of easy baby steps for tree trimming in the most efficient and safe way. Correct cutting equipment is an added advantage so that you can have an easier time. You can chose from a variety of high quality products in the market. Ensure that the saw you’re using is sharp and that if it is gas powered it has a full tank. The cutting equipment should provide you with both comfort and easy mobility hence invest in a high-powered machine. Even though the average homeowner can do a pretty decent job of tree trimming there are times when you need an experts help. Take into account the risks involved and the fact that you might get the whole thing wrong and cause damage to tree an opposite of the intended purpose of the trimming process. In essence what counts, as tree trimming should not be a daunting task once you understand the basics behind the process. You can help your tree get better health and add to its aesthetic value. You should remember that with each cut you make or destroy the tree. Get the time right, use correct equipment and always have a purpose behind tree trimming.